You're either going to love the new face of the Mustang GT or hate it. The Ford Mustang is due for a refresh this year. Nothing is official, but said refresh could bring a ton of changes to the iconic muscle car. These include: more power, a new 10-speed transmission, the elimination of the naturally aspirated V6 engine as an option, and of course a revised design. Of those things all we can confirm is that the new Mustang GT will look different, with a design that may prove polarizing. 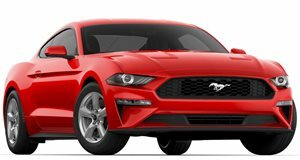 We know this because Mustang forum Mustang6G just posted a video of running footage starring the 2018 model. How forum member Adam7583 got his hands on this video is unknown, but it sure does look official. Unfortunately you can’t hear the V8 engine roar as the whole video has a rock soundtrack. While we would have loved to hear the new Mustang GT in action, this video does reveal its new look fully. Glass half full, right? So, how do you think Ford’s design team did? Opinion on Mustang6G seems to be split, with some saying the front end is a wreck and makes the car look sad. Others are taking a “wait and see” approach, promising to judge after seeing it in the metal. As for us, well we don’t think the front end looks terrible. Yeah, the grille design is on the sadder side and the deletion of the fog lights is something we’re iffy on. That being said those new headlights are sharp and that little wing is awesome. Like many Mustang6G members, we’re going to wait until we see it in the metal to pass judgement. We may not have to wait very long. The exterior design cat is out of the bag, which means Ford is either planning to debut the refreshed Mustang in full sooner rather than later. If not it may feel pressed to do so given the leaked video. Take a gander at the clip and let us know what you think about the design of the new Mustang GT.